McKinsey Consulting, you got some 'splainin' to do! The consulting behemoth magicked up an "internal report" to figure out which Twitter activists were most influential in criticizing the Saudi government in 2015. And somehow those same activists all ended up silenced. But now that the New York Times told the world about it, McKinsey is "horrified." You see, the company never had any idea that their "internal report" would be used to target government critics, perish the very thought! This weekend, the Times published a story about the daily firehose of Twitter abuse aimed directly at slain reporter Jamal Khashoggi by the Saudi government. The harassment was directed by intelligence head Saud al-Qahtani, who was deputized by Crown Prince Mohammad bin Salman to quash online criticism, as all your best modernizing despots do. Qahtani was one of the bad apples recently fired in the post-Khashoggi purge. But back in 2014, he put out an ad looking for young men willing to attack regime critics online for $3,000 per month. Its directors routinely discuss ways to combat dissent, settling on sensitive themes like the war in Yemen or women's rights. They then turn to their well-organized army of "social media specialists" via group chats in apps like WhatsApp and Telegram, sending them lists of people to threaten, insult and intimidate; daily tweet quotas to fill; and pro-government messages to augment. Qahtani's minions even managed to recruit an inside guy at Twitter to access user profiles, until Uncle Sam tipped off @Jack, who fired the mole. Luckily, you can just buy most of that data on the open market these days. Why waste energy running your own analytics where there are vaunted American companies vying to ferret out the best targets for your harassment buck Rial? Which is what seems to have happened in 2015, when the Saudi government faced blistering criticism for introducing austerity measures after the price of oil cratered. 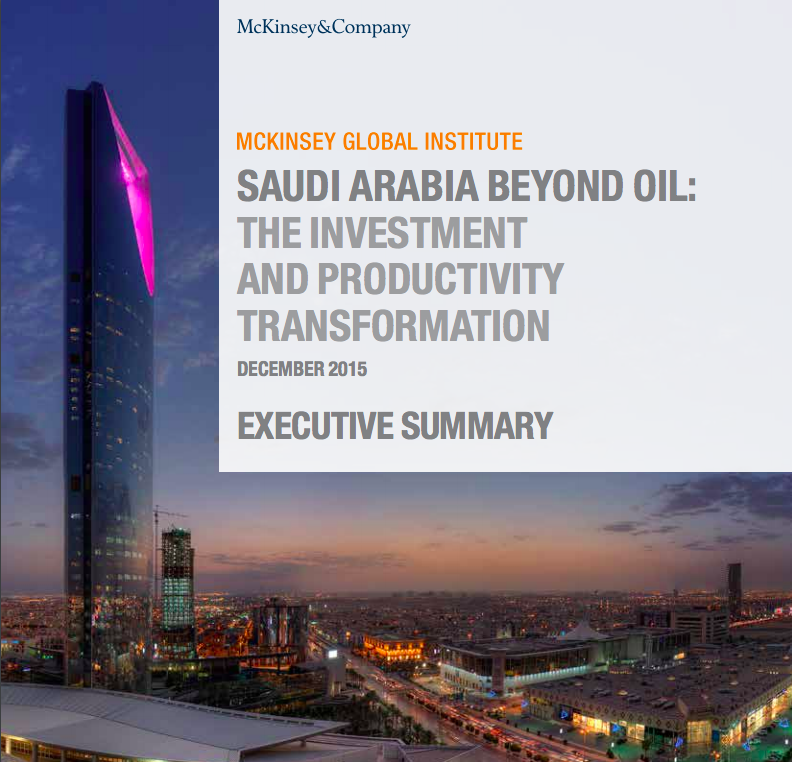 Look at this fancy Executive Summary McKinsey prepared in December of 2015 touting KSA's amazing economic outlook and the company's own service to the kingdom since 1957. By sheer coincidence, McKinsey also produced an "internal report" at that time identifying the most prominent social media critics of those austerity measures. In a nine-page report, a copy of which was obtained by The Times, McKinsey found that the measures received twice as much coverage on Twitter as in the country's traditional news media or blogs, and that negative sentiment far outweighed positive reactions on social media. Wow, the same three activists mentioned in McKinsey's "internal report," which was written at the same time it was generating that expensive prospectus for KSA, wound up targeted by the Saudi government? McKinsey's response leaves one or two questions unanswered. Questions like, why would a commercial business expend resources to generate such an "internal report"? And, do they think we're all a bunch of goddamn idiots? We were never commissioned by any authority in Saudi Arabia to prepare a report of any kind or in any form to identify critics. In our work with governments, McKinsey has not and never would engage in any work that seeks to target individuals based on their views. The document in question was a brief overview of the publicly available information looking at social media usage. it was not prepared for any government entity. Its intended primary audience was internal. We are horrified by the possibility, however remote, that it could have been misused in any way. At this point, we have seen no evidence to suggest that it was misused, but we are urgently investigating how and with whom the document was shared. Let's go out on a limb and assume that if McKinsey generated this report as a part of a general study on social media responses to global austerity measures in, for example, Greece, Italy, Argentina and Saudi Arabia, they'd have said so. Instead they left themselves a lot of wiggle space, claiming the "internal report" was "never commissioned by any authority in Saudi Arabia" and was intended for a "primary audience" of internal users. Which seems like space enough to drive a whole truckful of fishy fish through, driven by any number of members of the Saudi Royal family acting "on his own." Give it up, McKinsey. We smelled ya coming a mile off!